reliable and cost-effective pool deck services for Las Vegas! There’s nothing quite like the beauty of pavers around a pool. Pavers cost about the same as bland concrete but add visual interest and safety to your pool area. As one of the leading Las Vegas pool decking companies, we take pride in doing the job right the first time. You can count on our pool deck paver contractors to bring your vision to life with money saving paver decks built to last. 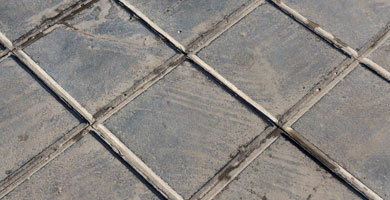 Pavers resist mold and mildew. This is an important feature in a product installed in a wet area. Chlorine does not affect the color of the pavers. Joints absorb moisture to leave the pavers cool under your feet. Pavers are foot-friendly as they are resist skids and slips. They also feel soft on your feet. Most pool pavers exceed ADA guidelines for traction. 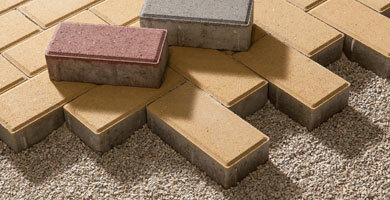 Pavers are sold in a huge array of styles, colors, and shapes. You can design a pool deck that best matches your home and pool design. Pavers can be used to build matching pillars, raised seat walls, and planter boxes. Pool pavers are very strong and can be spot replaced. 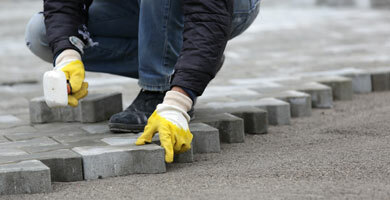 If a paver becomes damaged, it can be lifted and replaced easily. This also makes it easy to perform plumbing repairs under the pool deck without hurting the deck itself. Long-term value. A paver deck can last for decades with little care. This cannot be said of slab and stamped concrete. Pavers are an affordable way to boost your Las Vegas home’s value. Paver patios and pool decks have among the highest returns of outdoor home projects. 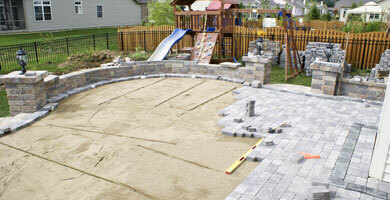 Get answers to common questions we are asked about paver pool decks in Las Vegas. Q: How Much do Pool Pavers Cost? A: A paver pool deck has a similar upfront cost to stamped or slab concrete. Pavers do have a lower long-term cost, though. This is because pavers do not require much care and last longer than concrete. Q: Do I Need to Use a Sealer on My Paver Deck? A: Sealing a paver pool deck in Las Vegas has many benefits. The right sealer can strengthen the colors of your pavers and help avoid stains. 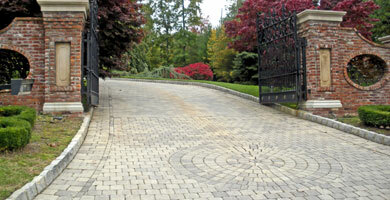 Most pavers settle about 30-60 days after they are installed. This is when the pavers can be sealed. 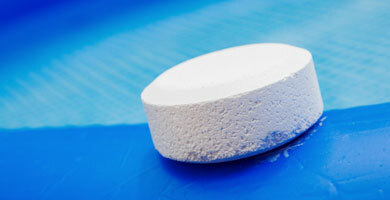 Ask our Las Vegas pool deck experts about sealing your pool deck. Our techs will let you know when it’s safe to use sealer as the pavers will need time to breathe and expand before the sealer is applied. Q: Can I Use Pavers Over Existing Concrete? A: If you have a stamped or slab concrete but you’d prefer the look of pavers, you do not need to tear up the concrete. it is possible to install pavers over your concrete pool deck. Rather than using the normal method to install the pavers, a paver overlay can be placed over the concrete. There are a few points to consider before choosing pavers around a pool with concrete. For this solution to work, your concrete must be in good condition with a smooth surface and no large cracks. There must also be room to add pavers over the concrete without blocking doorways or posing a hazard. To install pavers over concrete, our Las Vegas techs will use a pressure washer to clean the surface. After the concrete dries, border pavers are glued with mortar and a 1” layer of sand is added. This allows water to drain off the concrete slab. The pavers will be laid on top of the sand and sand will be swept into the joints to lock the pavers together. A: Pavers for a pool deck have a very long life. With most pool deck options, the lifespan and appearance will be based on the installation. With concrete, large slabs will crack over time and become uneven due to settling and tree roots. Even with repairs, a concrete pool deck will show its age. Pavers get stronger as the settle. The individual pavers can always be replaced when needed. The pavers themselves are made to last a lifetime. 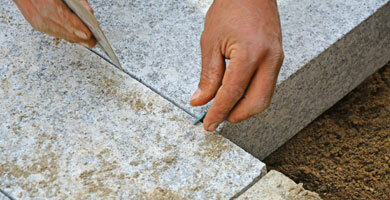 If your pool deck gets an uneven area, the pavers can be removed to correct the ground level. A paver pool deck will last longer than stamped concrete and slab concrete. You can expect your pool deck to last a lifetime with releveling and individual paver replacement as needed. The only thing that can really reduce the lifespan of your paver pool deck is poor installation. Q: Do Pool Pavers Need Maintenance? A: Concrete pavers are dense and nonporous to resist algae and mildew growth in pool decks. There are still ways to extend the life of your pavers and keep your pool deck looking its best. Applying sealer is a good way to help the pavers repel water and stains. 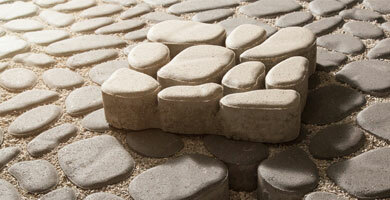 You can also have the joints between the pavers filled with polymer sand that hardens to prevent erosion. If you fill the joints some time after installation, the joint sand will need to be refilled every 2-3 years. Aside from sealing and adding new joint sand, the only regular care your pool deck will need is sweeping and rinsing. We are committed to reliable and cost-effective pool deck services for Las Vegas and Henderson homeowners. If you are planning to install a new pool or update the look of your existing pool deck, contact us today to learn more about the benefits of pool deck pavers. We offer free estimates on all paver pool deck projects.